Sijke and Sjoerd de Jong to the Hoogland family. Eldred MN May 9 . 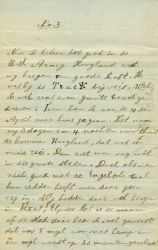 So I want to drop, you a, few lines Hoogland [in Dutch:] because it is a long time ago, that I wrote a letter to you, I thought, to do it now for a moment. Well first about the weather. We have 150 fields [acres] wheat in it [sown], and 55 fields oats. But that is not enough yet, we have to sow more oats and also about 30 acres wheat and corn. It has been bad weather here, we could not go on the fields for one whole week. 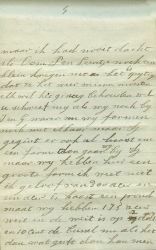 This spring I am here now with father and Joe andringa to help but I think that I'll leave next week to that farmer where our Lieuwe is going to live when he comes here in Minn.[esota]. We expect him every day now Hoogland. 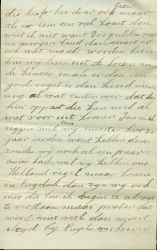 Mother is looking forward to a letter, from Holland. 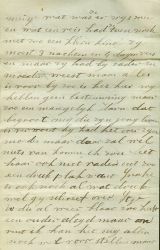 Now it is nice for Lieuwe when he comes here because he has a place [to live and work]. It is that place where Johannes and Gaatske and Klaasje and I and Tjaltge all were working before and father was there also for 6 months. It has 640 acres*[See note at the bottom of the page] land, totally his own farm. 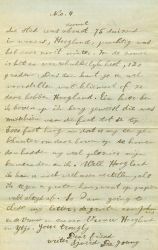 Well Hoogland I think you'll know, that I was a soldier here in the U.S.America. I have been almost 6 months in the Camp. I was in New Mexico for a few months and I was a bit longer than 3 months in Texas. Life is good in the U.S.Army Hoogland, because we got good food. I was with the truck-drivers, well sometimes I drove such a large truck. Then I went home on April 4th. It took 3 days and 4 nights to go home Hoogland, it was a nice trip. Then one sees a lot in that big cities. But if one can manage well in the English language one does not notice that. We had a lot of mountains there in Texas, El Passo is the name of the city where I've been many times. It was 5 miles from our Camp and for one mile we count on 20 minutes. The city had about 75 thousand residents, Hoogland, it was beautiful there, never Winter. During the Summer it is terribly hot there, 120 degrees. So you can imagine what kind of climate they have Hoogland. Once I was on top of a mountain may be it was from the foot till the top 8000 feet high and it is such a climb to come on top of it but we had a lot of fun, my comrades and I. Well Hoogland I can tell you a lot more, when I could talk to you [in person], but on paper it is more difficult. 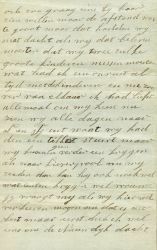 [In English:] So I am going to close my letter, [in Dutch:] greetings to Johannnes and his wife and also to Mrs. Hoogland and Ytje. 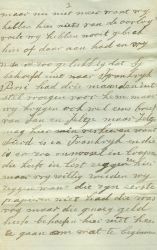 [In English] Your trougly [truly] dear friend writer Sjoerd De Young. *The word acres is pronounces as the Dutch word akkers which means fields. So most of the emigrants used the word akker(s) instead of acre(s). 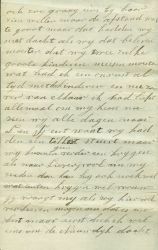 Well I received a letter in which you declare your regrets about Tjaltje and it is a painful feeling. She was always very dear to me when she was here with me when she got that little girl. She always was very happy when she was with mother but when it was over she also had more longing for home because she had such a good husband she always said, mother didn't have to worry about her but this illness [likely is that is was the Spanish influenza] took a lot of young peoples lives and I would have visited her with pleasure but the distance was too big. But we never had thought that we should live to see that we have to miss two such grown up children. I always was restless about the children and now so far from each other, rather I would like to have them around me. Now we look out every day for L. and Tj. Because we sent a ticket but we couldn't get one farther than to Liverpool. So we said then he also can get some money. 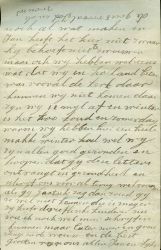 Well Mrs. [Hoogland], you asked me if we like it here, now it is well but first I had to think often about the Nieuwe Dijk, but not any longer because here we didn't feel anything of the war [WW I] and we never had a lack of something and we were happy that Sj[oerd] didn't have to go to France. 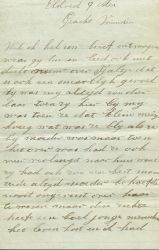 [Mr.] Perry asked 3 months delay for him but sometimes we get a letter from Jan and Jeltje but Jeltje don't like it here because Sierd is in France. He so easily walked into the trap, he has 'in list' [enlisted] as they name it here, but voluntarily we should say. Because the one who didn't have his papers he was free. But the one who has enough money didn't have to come here to start something, he has it also better there but when there comes a recession then I don't know. Because 300 guilders for a 'morgen' land [as much land as one can plow in one morning, in this case most likely that was meant a Bildtse morgen which is 0,92 hectare] than there also have to be made something [good harvest or profits]. Here we live from the cows and the hen's and when we have a good harvest people can save a lot of money. So the one who takes care can get on well. Jan and I often say that we should have come here 20 years earlier than we could be rich now. Well we have our Dutch habits but when there come English [people] than we also associate with them. I started to understand them a bit but talking that becomes not much. Then you always must be among them. Here it is very expensive when we need a doctor. It cost Gaatske 20 doll[ars] when she got the [baby] girl but it is even more expensive with Harm. 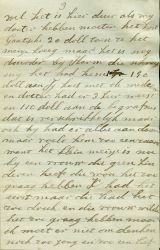 He wrote me that ir cost him 150 doll[ars] for Tj[altje] including the medicines and the doctor came 3 times and 110 doll[ars] for the funeral which is terribly [expensive] but oh he had done everything he could. But now he feels very lonely because the little girl is now with a childless woman who wanted to have her very much. First it was with K. but she was very busy and that woman wanted to have her so much. I don't have to think of it, so young and such a dear girl. What was she happy with it and what a trip she had to make with such a young child, she had to travel for 3 nights and 4 days but she visited father and mother. But now everything is over. So it is here, we don't have a destination but a man like Harm, I am so sorry for him. His young life is destroyed, he was talking about his mother but that won't happen. I also would not advise it to her from such a busy place because Ynsetie [?] is also very busy. Well you wrote about Ytje, is she already recovered, that is the way a parent always is restless. I still can remember you all but I never had thought that uncle P. and Leentje should get a baby yet and it is a pity that they had to miss it again, everyone likes to keep it. Well you wrote if we were still with J. and G., we are still farming together but Sj. already likes to start a farm too, in that case we go with Sj. We have a big farm here, I don't know, I guess, about 300 acres and an acre is almost a 'pondemaat' [0,3678 hectare]. We have 175 acres wheat and the wheat is 2 doll[ars] and 10 cent a bushel so if it gives something [ a good harvest] then one can make a lot [profit]. Jan does not have to work hard here, he doesn't have to toil. But oh there are things which were better in Holland, especially the church, we cannot go there, it is 12 miles from here and during the Winter it is so cold and during the Summer days warm. We had a very mild Winter. We all are healthy and hope this letter will find you healthy and please write us back. Well Mrs.[ Hoogland] if you could see Gaatsche you would not recognize her. She is lean and has 3 fine children. I could write some more but later on I will and greet Jentje and his wife. Greetings from all of us. Jan and Sijke. 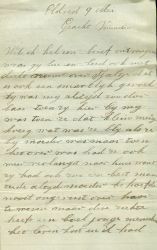 [Upside down on top of the page is written] Especially greet Joh[annes] and his wife. Be so kind to write some characters back.